If you’re looking for one of the more fun summer movies that have no intention of taking itself seriously at all, might I suggest Lucy, which is one part superhero origin tale and one part wonky French existential drama. It starts off quickly, with the titular character being forced into a being a drug mule. The substance breaks in her bloodstream and the concoction transforms her from meek to a kickass vigilante of science. Lucy can now access far more of her brain’s potential, not just that meager 10 percent we plebs utilize, and who knew that we could all be superheroes if we really put our minds to it? Despite the presence of Morgan Freeman as really a talking head to let us know about the potential of the human brain, none of this really makes any sense, and thankfully the movie doesn’t pretend that it should. 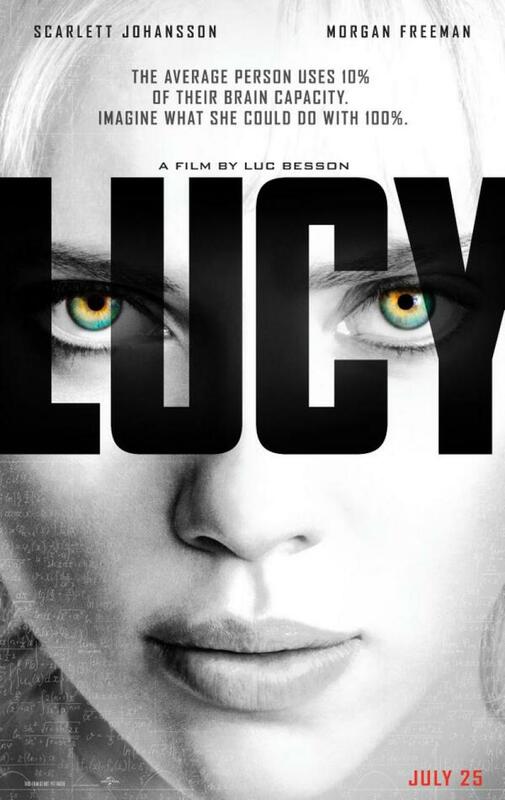 Lucy literally gains a new superpower every time we see her, from telekinesis to manipulating radio waves to eventual manipulation of matter and time travel. Yeah, it gets weird, but thankfully it’s also relatively entertaining, funny, fun, and short and sweet at a briskly efficient 90 minutes. The plot doesn’t exactly feel fully developed, more a gallop between events as we charge up the percentages from 10 to 20 to 30 percent, and so on. The criminals don’t seem like much of a threat despite their numbers. I’m shocked nobody assessed what happened to Lucy and said, “Hey, maybe I should ingest this drug into my bloodstream and become a super powerful being too.” While the action is well orchestrated, there is less of it than advertised, as Lucy spends a good amount of time adjusting to her new self-actualized human superiority, played by a detached yet amusing Johansson. I can’t even explain the bonkers ending except to note that maybe there’s a very good reason why human beings were not capable of using a maximum percentage of their brain’s capacity. It doesn’t make much sense but it’s pretty, entertaining with its messiness, and short enough not to waste your precious time. Posted on September 8, 2014, in 2014 Movies and tagged action, drama, luc besson, morgan freeman, scarlett johnansson, sci-fi, strong heroine, super hero. Bookmark the permalink. 2 Comments. Good review Nate. It’s a crazy movie, but it’s a very fun one that I couldn’t help but just play around with. Something I haven’t been able to do with a Luc Besson movie in quite some time. Isn’t using 100% of your brain all at once called having a seizure? Lol, this movie looks totally nonsensical like you said, but I might pick it up as a rental later on. Johansson still seems to be searching for that role that doesn’t employ her as either a quasi-Lara Croft 2.0 or generic attractive female lead. I feel like she has the acting chops to take on deeper characters though, as I loved her in Spike Jonze’s Her (2013) and she didn’t show her hot bod once in that.